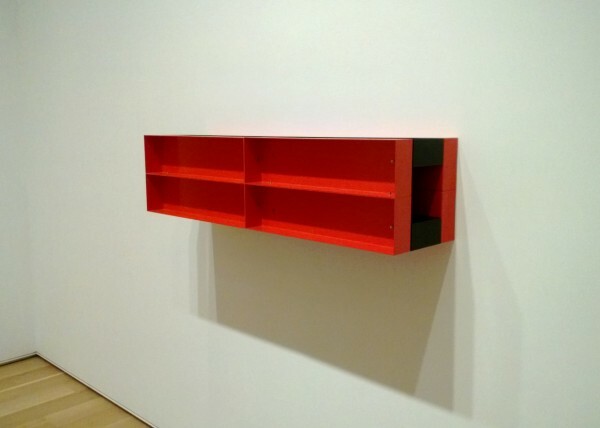 As I was walking through the Modern Wing at the Art Institute of Chicago not long ago, I noticed a late Donald Judd, Untitled, 1989, on view. A wall-mounted, boxy, red and black sculpture, vacillating between image and object, I found myself walking around it, going from side to side, taking it apart in my mind. Despite its seeming simplicity, the work drew me deeper into the implications of its facture. From a slight distance, it looks virtually immaculate â€“ by the standard of most artistic mark making, it is. Of course this was typical of minimalist work from this artist and others of the 1960s. The shapes have a certain predictability verging on total blandness, like a Steelcase office desk. One reads about the importance of the gestalt of this experience from artists like Robert Morris, which he believed lead to a more holistic, unified apprehension of the object. â€œUnitary forms do not reduce relationships,â€ he says. â€œRather, they are bound more cohesively and indivisibly together.â€ On the one hand, the rectangles empty out the object, being everything and nothing, though they might lead to some kind of mathematical spiritual reverie. Yet on the other, in this particular work by Judd, we can perceive a distance from aspirations toward a unified experience in a few ways. Looking closer at the surface â€“ the fasteners, the corners, the paint â€“ I feel a certain fascination for its proximity to, and utter failure to join, that virtual phantom world of forms. The â€œresemblanceâ€ to an imagined perfection makes the distance from this realm seem all the greater. The corners in the metal have a diameter. There is nothing instantaneous, simultaneous, intersecting, coexisting. The screws, though each meticulously tightened and turned to top dead center (â€œdeadâ€ in that turn of phrase being particularly appropriate to the general inertia), announce their absurdly disruptive presence, like boulders being dropped in a glass-smooth pond. The surface of the paint, machine-even, still betrays the slightest speck of dust or fluctuation in thickness. And the colors, well, they donâ€™t actually seem like they follow any particular logic at all, save that they were commercially available as is. In the sphere of this type of artwork, these aspects are magnified from being mere details to critical features. We go from what is presupposed (â€œitâ€™s held together somehowâ€) to what is foremost in our consciousness (â€œthe screws are exposed and meticulously turnedâ€). This leads me to thinking in general about an aspect of the art that I am often drawn to, and the art I like to make, where one looks for ways to investigate the liminal areas of the process of making and enlarge upon ways of becoming. Beyond the physical, it seems important to consider how the objectâ€™s resulting attitude relates to issues outside of itself â€“ whether it wants to or not â€“ allowing the work to be permeated by contextual notions. We can observe a world where the particular diameter of a metal corner is a metaphor for the problem of actually doing what one thinks. The speck of dust on the surface can be what happens when ideas are tested, moved around, creatively misread and complicated by personal and social circumstance, material, process, and even broader subject matter. In the 2011-2012 exhibition at Chicagoâ€™s Museum for Contemporary Art, The Language of Less: Then and Now, we were reminded of how the echoes of minimalism are still felt in vital, current artistic practice. I take Gedi Sibony, whose personal biography of being the son of a contractor seems to have informed much of his often slight, provisional work as a prime example. 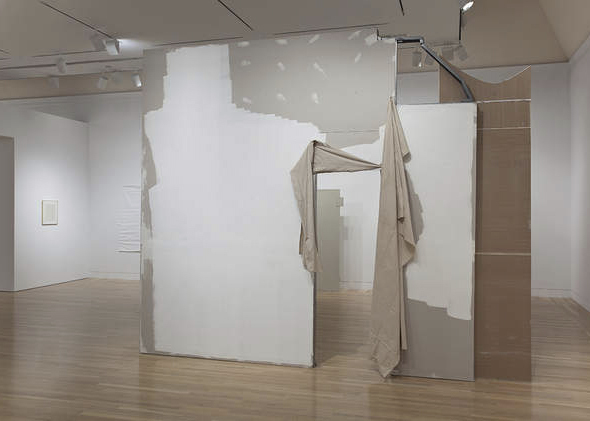 Included in the exhibition, The Cutters, 2007/2010, a dry-walled portal adorned with sketchy paint, spackle and loose canvas, seems quite direct in its relationship to the artistâ€™s life experiences, though the manner of its presentation leaves us at a definite remove from these facts. There is a way the work slips past us and lets us wander without being pinned down, though no doubt the particulars are also what charge it with presence. The title for the show and catalog actually derive in part from conversations like the one between Sibony and curator Michael Darling, where the artist wanted to avoid the term â€œminimalâ€ to describe his practice. Instead, he talked about â€œmaximizing spaceâ€. While I might hesitate to go that far in describing his work, there is doubtless a greater assertion of content and experience through the use of spatial relationships, involving somewhat idiosyncratic motivation, and more particularity than one would expect from something in the minimalist canon. On the other hand, what Sibony seems to draw from this tradition is its ability to make us notice not only the space weâ€™re in and how we relate to it, but to make us look more intensely at what is actually there â€“ as with the fasteners on the Donald Judd. So what we have here is something more like a methodology of focus, than that of reduction, per se. In my own practice, small perturbations are to be multiplied and dilated; brought forward to be enlarged. Fissures between potential and imagined, present and executed are widened. Any time I can find a troubled intersection of intention and doing, imagining and becoming I want it to be fore grounded. Prioritizing space, form and material rather than image, metaphor and text doesnâ€™t preclude the latter, but allows me to focus on what is happening in the made object, what happened during its making, and how bringing that experience to bear in the viewing situation acts a kind of demonstration but also as a site for instigating and considering ideas and their implications. Things should stop short of anything too transcendent or settle only for what is concrete or commonplace. Dealing with the facts is important, but I donâ€™t expect things to stay put there. Better to look for an experience that shuttles back and forth between something like the transcendentalism of Suprematism and the facticity of the readymade â€“ a dyad of artistic renunciation of the temporal and embrace of the spirit and intellect. On some level, things should be a little dirtier, interfered with and multifarious. I mean by â€œdirtâ€ a sense of something that isnâ€™t necessarily supposed to be there by some tenet or other, or is in a way incongruous with it; a complication that has a complication. So with regard to some framework, the artwork should take a step in and a step away. Something meticulously â€œdesignedâ€ in a CAD system can be made by hand with rudimentary tools. Painting can be done with â€œbrushesâ€ that are whole images, letting them interact on the surface in a way that multiplies context, so expression is built up not only from each successive mark but from the baggage the marks carry. 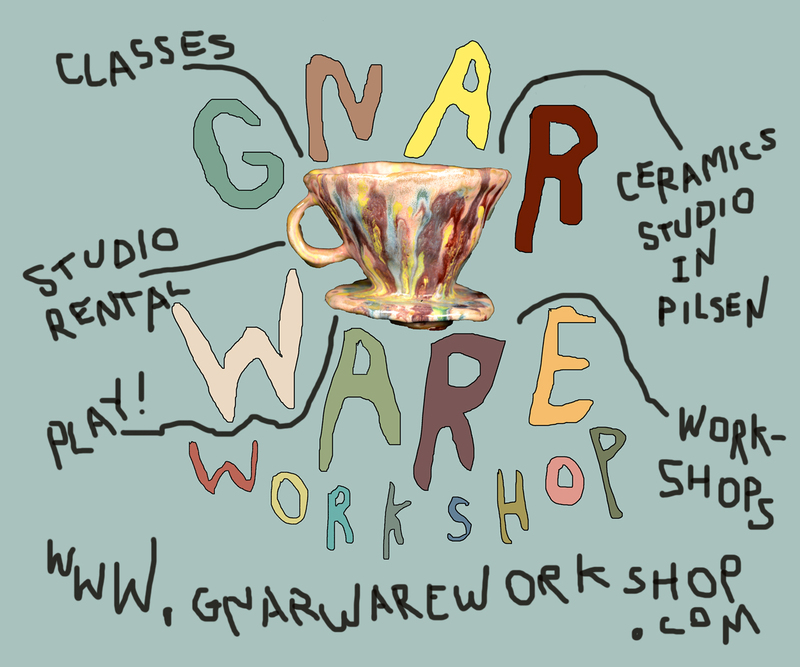 Personal histories and studio histories can be starting contexts. A finished piece is a context for another through it actual use in part or whole. The branches in the process of construction can be turned toward another project. Perhaps this is a version of the deliberate cataloging that R.H. Quaytman does, except itâ€™s not being declared so such as much as its being done genetically, so to speak, in chains of production that cause each other. Even more than this I see reason for exhibitions containing objects that are out of phase rather than exhibiting a single end point of a creative stretch of time, avoiding monolithic bodies of work to be shown at once. Perhaps two, three or even five different aspects of a view on things is called for. The problematic for me here is a kind of foreshortening effect of cultural production and its vacillations. Taking a cue from Walter Benjamin’s ruminations on the melancholic, no particular idea becomes overly reified, nor is there too much trust lain in detached universals. It is a basic predicament not only of importance to art, but in life. Ideas are placeholders, and reality is often beyond our tenuous grasp. We can perhaps hope to try to widen the island we stand on, but we can never know the ocean. Of course, a countervailing force to whatever direction Iâ€™m headed need not only be found in bodies and processes external to the one I begin with, but can be discovered inside them. Things contain their own undoing or re-emergence. For instance, repetition is a well-recognized minimalist impulse, but it can be used not to eliminate the presence of the unique and idiosyncratic, but as a means for things to transform and estrange themselves, taking them to another place perhaps even opposite of where they started. For example, a repeated line, a layered image or a structure turned on itself can be made to collapse and then crystallize into a different appearance or meaning. To borrow a word Chicago artist Steven Husby has been fond of using, we could call this type of repetition or self-transformation recursion. Itâ€™s a term used in mathematics and in the study of nature. What I take from it is the notion that sometimes doing the same thing repeatedly doesnâ€™t produce the same results; that feeding something back into the same process can cause it to change exponentially. I think here of Eva Hesse and some of her not-quite primary, post-minimalist forms. Even her relatively simple structures, like boxes, cylinders and lattices were greatly complicated by the potential readings of their fabric, latex or metal components. Especially interesting here is a piece like Accession II where what the material could do took it well beyond its default reading as plastic or steel. In particular, the way the plastic tubing is inserted into the structure, piece-by-piece, generates an altogether different experience. 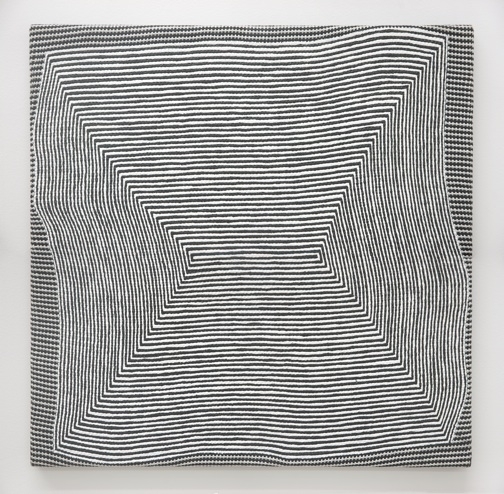 It is holistic but of a totally different order than early Robert Morrisâ€™ geometric gestalt. The entirety is radically different from the parts as opposed to the parts servicing the entirety, or even the parts just fitting into the whole, which was a complaint Morris had about painting. This is an aspect that makes her work not only post-minimal but potentially instructive for us today as it opens up the end-gamesmanship of minimalism for future use â€“ again, the aforementioned methodology of focus rather than less. But itâ€™s not at all the formalized focus of a hierarchical academicism, but the character of a certain specificity of the experience. Other transformative uses of material that take minimal precepts beyond even this to other subject matter to include the likes of Felix-Gonzales Torresâ€™ candy installations, with their heartbreaking references to loss and Janine Antoniâ€™s Chocolate Gnaw, 1992, a form reminiscent of Tony Smithâ€™s Die, 1962, made thirty years hence from chocolate with large bitten-off chunks taken out of it, subjecting the austerity to obsessions over body image. 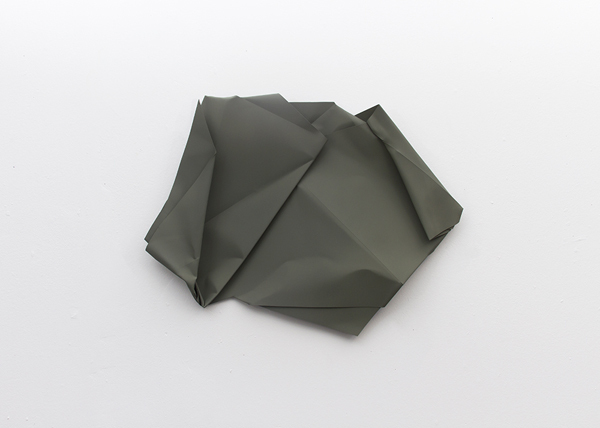 A local, contemporary artist who fascinates me with subtle material play in a fixed framework is Samantha Bittman. It’s a very close game of ruffled repetition in her textile-based painting-like pattern works. Weâ€™ve seen many attempts at the dialectic of image/object, painting/support in our time, but very few demonstrate a consistent talent for intertwining these issues in such a cohesive and distinctive way. There are patterns painted and patterns woven in the support and neither quite adds up to the other, as they incessantly confuse their figure ground relationships. The patterns themselves really are only pseudo patterns since the actual weave is nearly as varied in warp and weft as a gesture and the painted overlay is often equally complex in a more macroscopic way. At times the painted surface is almost indistinguishable from the support, but a tension always remains; a serene overall surface threatening to break apart from itself and its background. The material and its differing implications disappear and reappear into each other like sfumato ten times removed, born of a seemingly cosmic sense of humor. From the standpoint of the process, we could take cues from artists like Hans Haacke or (former) team of Peter Fischli and David Weiss. Haacke takes variously hidden or opaque critical stances toward larger institutional issues in his workings with natural phenomenon, such as in Condensation Cube, while Fiscli and Weiss deal not so much in formal visual tension but the actual tension of gravity in their photography and film, especially with the filmed running of a highly complex Rube Golderg machine in The Way Things Go. I will often consciously interleave some sort of external chance or physical process into things, ala the fluctuating Cube, so that whatever Iâ€™m thinking is shifted or channeled if not completely determined by it. The incorporation of a complex event like a crushed object, or the grain in a piece of wood can spin things around formally while the determination to involve bodies, events, and physics in this way is critical to the desire to foster interplay between idea and outcome, connotation and fact. Alternately, Fischli and Weissâ€™ film is not only another example of physical phenomenon (gone hilariously absurd) but that it was filmed and edited, to the point where we really have to question what did and did not happen, is of great interest. At several points the artists seem to hide their transitions in plain sight. The viewer can be convinced â€“ by the extremely well worn and nearly invisible trope of the dissolve transition in film â€“ that two connected takes really do match up with the same chain of cause and effect. Letting yourself pause on it, the realization comes that it probably went all wrong and they had to kick start it. These breaks transition us between natural and cultural facts; the will and desire to make the system keep going, or at least make it appear to keep going despite contrary realities. This sense of dealing with gaps, losses, and non-sequitirs enters my work on a regular basis. Looking closer at this, I see my sculptures, for instance, as reactions to broken, self-contradictory and attenuated geometric structures. As I work with them, Iâ€™m trying to bring them to a place beyond themselves, to have the initial breakdown re-emerge as some new cohesiveness that in its own way seems kind of inevitable, but really is more like one of many potentialities. There are cascading decisions to make. First, I have to think about the sculpture being a practical object that can hold together physically. Some forms of sculpture contain tabs, rods and armatures, but I will tend to make those parts that bear the structure a part of the form that one sees. Having a certain range or degree of relief is important for the objects status as something for the wall or floor. I consider whether they are balanced or unbalanced, try to involve myself in convolutions or extricate myself from them in some way, and try to recognize a character that emerges. This character can appear after one or two moves or after 50 moves, or even on the last touch. In one case, with a piece I called Double-Sided Painting, I didnâ€™t realize what it was until I tried to hang the piece on the wall and noticed that both sides of it fought to be the â€œfrontâ€. So I hung it on a mount that suspended it in space so each aspect could have its say, not to mention point toward something like traditional panel painting which often involves using both sides to tell a story or perhaps simply to recycle a costly wood panel. Other times, the character involves a certain sense of gravity or volume, a particular structure that presents itself as needing to be built â€œaroundâ€ or is relevant to something I had to do to the piece to make it â€œgoâ€. One I titled Twoohsix really had something to say to me after I stood on it with all of my weight to make it do something â€“ the compressed words of the title being my approximate body weight. Living between polarities, looping through historical and contemporary artistic practice, taking an ending as a beginning: these induce for me a constant state of movement in the art. On a personal level, for whatever reason, life has led me to change my place of residence a number of times over the last several years. So in a way I feel like these disruptions, beginnings and endings have become a bit ingrained in my psyche as much as it has been a part of my art practice. One apartment was on the 6th floor of a building in Edgewater that had a view of the lake. The vista was framed by a couple blocky apartment buildings. It made for a striking image of nature and construct and I would regularly take pictures of the sunrise as filtered through these concrete monoliths. Looking at the images over time, I thought if you didnâ€™t know the time and location, it might be hard to tell if it was morning or evening. Astronomically speaking, it all may look much the same â€“ the star bears a relationship to the horizon of the planet earth from my vantage point that produces a characteristic range of hues in the sky. The sun being 18 degrees below the horizon, according to accepted standards, defines both. Those are the facts. Most likely our circadian rhythms or some other such way finding apparatus make it easy enough to distinguish dawn from dusk as youâ€™re there in it. And to me thatâ€™s the part about spending time in the studio that will probably never get old for me is not quite knowing what will spin the one into the other until it is experienced, whether itâ€™s something in front of me or something from history considered from a given moment now. The title above was taken from the first line of the R.E.M. song Low, released on the Green CD in 1988. The video for that song has always struck me for its imaginative use and technological reanimation of La Confidence, c. 1880, by Elizabeth Jane Gardner. It complicates and broadens the experience of an otherwise rather academic scene of innocence and intimacy, combining â€œhighâ€ and â€œlowâ€ impulses and values of visual production. The very meaning of the painting seems vastly different by this act of recycling. As Iâ€™ve related elsewhere, this sort of play of past and future, and how something upon which the sun has set can be given new life, is a cornerstone to my own practice. Robert Morris, Notes on Sculpture, essay, first published in Artforum, February, 1966. On even closer inspection, I think one screw isnâ€™t at the same angle on this piece! Michael Darling, The Language of Less, essay, in the exhibition catalog for The Language of Less: Then and Now, 2011, Museum of Contemporary Art, Chicago, curated by Michael Darling. p. 27. Even when looking at the usual suspects like Morris, Judd, Flavin, LeWitt, McCracken, etc. there are a lot of different approaches, some even opposed, such as Morrisâ€™ and Juddâ€™s differing views on whether ideas of painting and sculpture can be commingled or not. At least early on, Morris seems to have taken a hard line against the admixture, though Iâ€™m left wondering â€“ for another place and time â€“ about his felt reliefs for the wall. For an interesting discussion of this, see Barbara Rose, ABC Art, essay, 1966. Such as he ponders in works like The Origin of German Tragic Drama, 1925. (See, for instance, the translation by John Osborne, London: Verso, 1998, paperback edition, pp. 138-142.) It is important for me to note a fascinating passage later in the chapter on the the ancient views of the saturnine disposition being countered by the influence of Jupiter, or Jove, the origin of jovial. For starters, making art is, to me, in itself a jovial thing to do. This is the dialectic I’m touching on, not to take melancholia as some kind of prescription. This seems to be alluded to in Robert Morris, Notes on Sculpture. The issue was also discussed in Michael Friedâ€™s Art and Objecthood, Artform, 1967. Minimalism, ed. By James Meyer, Phaidon, paperback edition, 2005, p. 42. I am indebted to Jeremy Millarâ€™s book from the Afterall: One Work series, Fischli and Weiss: The Way Things Go (Afterall Books, published in 2009) for his excellent, in-depth analysis of the artistsâ€™ film. ROBERT BURNIER is an artist and writer who lives and works in Chicago. 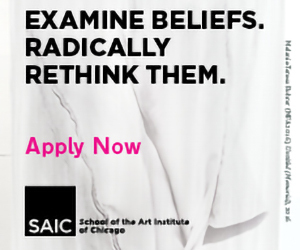 He is an MFA candidate in Painting and Drawing at The School of the Art Institute of Chicago and holds a B.S. in Computer Science from Shippensburg University of Pennsylvania. Recent exhibitions include The Horseless Carriage at Andrew Rafacz Gallery, Salon Zurcher at Galerie Zurcher, New York, the Evanston and Vicinity Biennial, curated by Shannon Stratton, and Some Dialogue, curated by Sarah Krepp and Doug Stapleton, at the Illinois State Museum, Chicago.